Some forms of communication transcend all things, even language and cultural barriers, like the love and affection we share with our pets. When bonding with dogs, sometimes the transition of bringing an infant into the picture can be difficult. In a recent, very adorable commerical, there are no words necessary (subtitles added later) to get this beautiful message across to an international audience about a newer baby being introduced to an existing Golden Retriever. When the dog approaches the baby, the infant cries with disapproval and the canine retreats out of the room. While the parents and baby are playing with a stuffed, toy lion, Dad notices the depression on the dog’s face and is clearly being left out of the picture. With a nod of approval to his best friend, the father places a quick online order and before you know it, a package arrives. 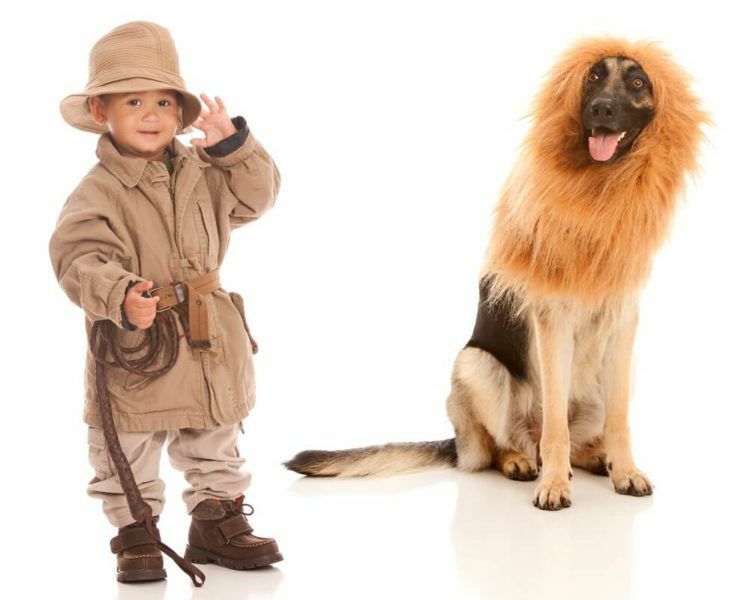 Next thing we see is the dog coming into the room wearing a lion’s mane costume. This time when the canine approaches the child, it innocently reaches out to the dog for a sensitive touch. In this thirty second spot first meant for a Japanese audience, it was so popular with animal lovers around the world, it can now be seen globally. The best piece of advice when making these types of introductions is to take baby steps, pun most definitely intended. To begin this important type of bonding, you’ll want to start out slowly and progress at a natural pace to protect your pet from unnecessary alienation. So in this case, you’ll want to begin long before the arrival of the baby. Think about pretending you already have an infant in the house by carrying around a doll wrapped in a blanket. With this “baby” in your arms, download some infant sound bytes or play videos that have sounds that will come from your little bundle, laughing, crying, cooing. Increase the volume slowly over time to allow your pet’s sensitive hearing to adjust to these new noises. While dogs are often known for sometimes having alarming issues with their hearing (think sirens and thunderstorms), they also have an extremely sensitive sense of smell. While any parent of a newborn can attest to the fact that an infant smells wonderful after a bath, but not so much at changing time. To get your dog accustomed to these new smells, if possible and time permits, bring home a blanket with your infant’s scent attached before they arrive home for the first time. Prospective parents of a newborn will likely have the nursery completely set up long before the arrival of an infant, but forget about all the other accessories that are brought out later. It’s best to bring them out sooner, rather than later, slowly but surely. This way, the homecoming process isn’t followed by an enormous amount of accessories popping up all over the house, which can quickly alienate a dog during this transition. Remember to do some breed specific research on your pooch before introducing them to baby to make the transition go smoothly. For example, some breeds are better than others when it comes to children and infants. Some terriers can sometimes have a “full of itself” kind of attitude when it comes to socializing and these animals should be treated with kid gloves around children, another pen intended. Great article, dogs are susceptible to change and these tips are great for easing your dog in to a new family dynamic.